Catching-up on delays in your clinic can quickly add to your agenda. Thus, rigorous monitoring of your patients and their appointments becomes a key aspect of your management, both for your clinic and for the satisfaction of the client's experience. With CTRL/Clinic, you can easily enhance your clinic procedures by adding informational value to your patients' digital data. Indeed, with the latest version of our software, you have the ability to configure the communication preferences of your patients to reach them faster. In the presence of several available communication coordinates, it is also possible to establish an order of preference between them. To this option can be added the integration of an automatic dialling platform directly into your CTRL/Clinic software. This will ensure that you optimize the administrative time of your clinic by improving your daily efficiency! Moreover, the CTRL solution supports the automated confirmation of appointments by email and text message since its version 9. When you use this function, as soon as a patient confirms an appointment through an email or text message sent using CTRL/Clinic, your agenda is automatically updated. The appointment status is then changed to �appointment confirmed� so that your staff can concentrate on the unconfirmed appointments. This saves your administrative staff time while promoting the diligence of your clientele. Take advantage of it! To know more about our healthcare management solution, contact a CTRL representative now! Will you be among the 40 participants to the networking dinner on April 24 at the SignorvinoMTL Restaurant & Wine Bar? 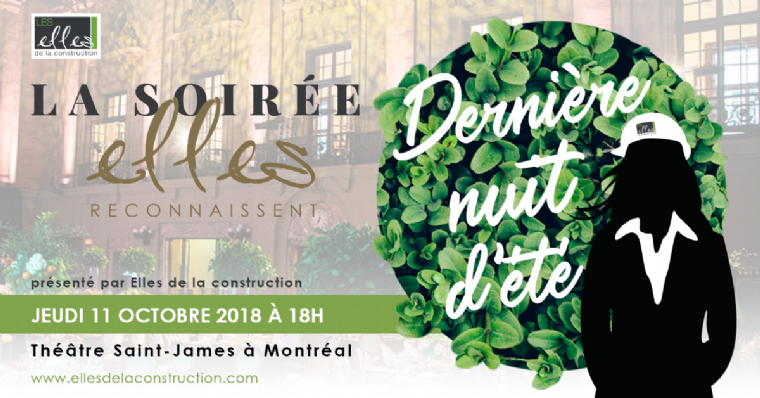 Presented by Les Elles de la construction, this 3-course dinner will give you the perfect opportunity to interact with others in a private and warm context. CTRL will sponsor this event with a door prize. During the dinner, you will meet several inspiring women including Myl�ne Paquette, a Montrealer and the first person from the Americas to cross, all by herself, the North Atlantic Ocean by rowing boat. Her solo trip took 129 days, starting in Halifax and ending in France. Several other personalities will also be there. For more information about the event, do not hesitate to contact the Elles at info@ellesdelaconstruction.com. AERMQ Annual Congress, We'll Be There! The AERMQ (Association des entrepreneurs en rev�tement m�tallique du Qu�bec) annual congress will take place at the Fairmont Tremblant from April 5 to 7. Once again this year, CTRL is happy to take part in this event as an active partner. 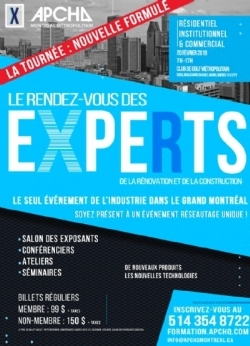 Defending the interests of construction professionals in Quebec is close to our hearts, and this event is an opportunity to discuss the subject and to present the good deeds of each actor in the industry. Our Development Business Director, Mr. Pierre Aubin, will be present to discuss the benefits of our construction project management solution that follows you anywhere, even on your construction site. With our knowledge of web technologies and mobility, CTRL guarantees you the ideal management tool to control the profitability of your projects in industrial and commercial construction. Whether you want to create a purchase order on site, manage subcontractor by project and supplier, or even enter timesheets on your smartphone, which integrates with cost tracking, we have the solution for you! We look forward to meeting you at the AERMQ annual congress to let you know all the advantages of the CTRL solution! Visit the website of the association to know the details of the event. 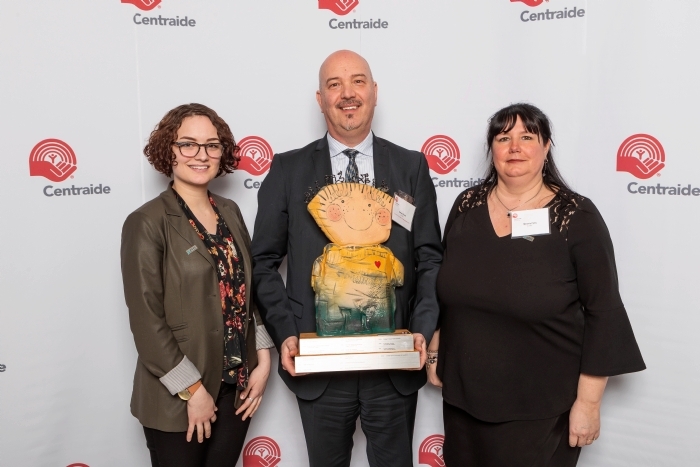 CTRL was awarded a Coup de Coeur in the Businesses and SMEs division during the closing of the United Way Centraide 2018 campaign! We could never have made a difference without the exceptional work of our social club and the generosity of our employees. 8,293 times thanks for every dollar raised that will help United Way Centraide support 201 organizations and projects in Quebec. In fact, the 2018 campaign reached a record $ 15,101,187, a first for this philanthropic organization! Thank you to all participants of the 2018 campaign! On the photo, from left to right: Maude Parent, Daniel Girard, and M�lanie Patry. Tomorrow will be held the second edition of the Rendez-vous des experts at the Club de Golf M�tropolitain Anjou. On the program; 25 exhibitors as well as several conferences and workshops surrounding the construction industry. All under one roof, it is an event not to be missed! CTRL will be one of the exhibitors and our development business director, Mr. Pierre Aubin, will be present to meet and discuss with participants our recent innovations. Come and discover our project management solution designed to provide you with the ideal management tools to control the profitability of your projects in industrial and commercial construction. For more information about the event, visit the APCHQ website. 2nd Edition of the DESTINATION Trade Show: We Will Be There! CTRL will be present at the second edition of the DESTINATION Trade Show, which will be held on Wednesday, February 6, at the Salon Urbain, located within Place des Arts in Montreal. This event, which will bring together more than 200 architects, offers exclusive training in the building envelope. For all the details of this event, visit the AERMQ website. 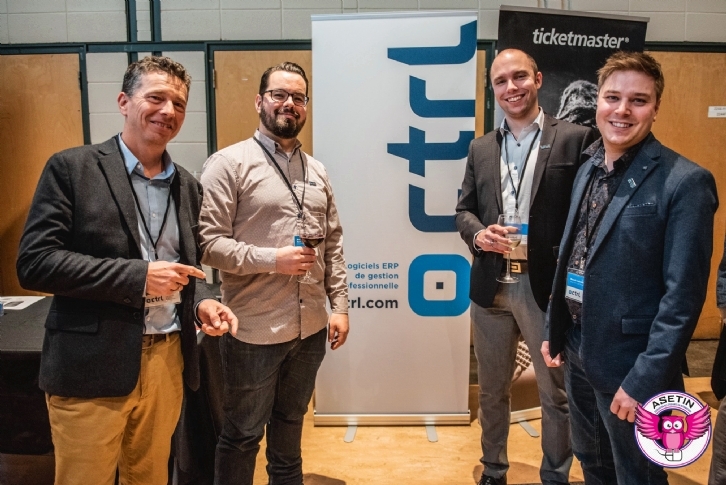 CTRL attended the 2019 IT Recruiting Cocktail hosted by ASETIN, the Association des �tudiants et �tudiantes en informatique de l'Universit� Laval, to expand our team with new interns and to offer various job opportunities. It was a real pleasure to meet the new cohort of undergraduate students in the computer science and software engineering department and to talk to everyone who stopped by our booth. For those who have not had the chance to come and discuss with us or for those who couldn't participate in the event, do not hesitate to send us your resume. We are constantly looking for new talent! At CTRL, we have a strong culture of internal development and many employees have risen through the ranks, sometimes even starting as interns to now occupy positions with more responsibilities, such as executives positions. Join our team! On the photo, from left to right: Philippe Constant, Rapha�l Marcoux-Tremblay, Michel Guit�-Beaudoin, and Benoit Lafond. In order to continue with our new logos and colors, CTRL's infrastructure and networking division, Ti Technologies, takes a new turn with a website now bilingual and responsive. We have enhanced the reading of each section so can have access to the information you need more easily. And do not worry, just like CTRL, they always stay one click away to answer your questions. TI Technologies, that fits into of our ERP solution, is composed of a team of specialists dedicated to optimizing your hardware platform to the highest standards of quality so can you focus on what matters most: the growth of your business. Ti technologies will take care of the rest! Did You Know That CTRL's Healthcare Solution Includes a Complete and Entirely Integrated Accounting Software? As we approach the end of 2018, you might be preparing your bookkeeping to possibly present it to your professional accountant. If you did not all of these benefits at your disposal, or if you wish to know more, do not hesitate to contact one of our clientele advisors. More Than $8 000 Raised for United Way Centraide - Thank You! For about 10 years, CTRL has participated in the Centraide Quebec and Chaudi�re-Appalaches campaign that makes it possible to invest in 201 organizations and projects, helping where the need is greatest. We believe in the cause of helping different organizations that can touch us, directly or indirectly, and it is with pride that our 2018 campaign ends with a total amount of $ 8,293.47. We wish to thank all our employees and each participant in our various activities over the past year. You have allowed us to exceed our goal and help an organization that fights on a daily basis to help our community. To make a donation to United Way, visit their website and make a difference in your community! 2018 Survey: Our Annual Meeting with Your Satisfaction! The year 2018 has been marked by an accelerated commercialization of the Web components of our CTRL management solutions. Our team is filled with enthusiasm with all the latest new features available and our upcoming projects. 88% of our customers said they were satisfied or very satisfied with its CTRL management solution. Every year, many tools such as the online training, the customized training, and the FAQ (Frequently Asked Questions) are constantly being improved to help you get the most out of your CTRL management solution and to reap all its benefits. Your suggestions are always appreciated, whether for the improvement of our products or our services. As in the past, to celebrate your collaboration in our success, we chose to randomly select, among all clients who participated in the 2018 survey and testimonials, a bank of a 5-hours service bank as well as a continuous training session of a total value of $ 550. We are pleased to announce that this year's winner is "PHYTRONIX TECHNOLOGIES INC", a CTRL client since 2001. A sincere thank you to all participants and do not hesitate to contact us for any additional information. *The result has been obtained in the context of a 17% response rate and an accuracy of 91%. After 25 years of existence, CTRL is getting a makeover with new logos and colors! If you have already seen our new logos on our social networks or on our website, you will soon be able to see them everywhere on our products. We know the importance of your time management, and with our website now responsive, you will shortly be able to read the different sections of our website more efficiently. And do not worry, we always stay available at one click to answer your questions. 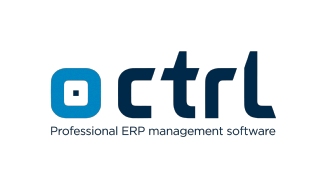 CTRL's mission is to be an active partner in the organizational growth of its customers by offering them a suite of innovative management software designed to optimize their operations and stimulate their growth. With over 900 active customers, including more than 15,000 employees and 6,000 workstations, we want to thank from the bottom of our hearts our partners and customers who continue year after year to trust CTRL. Thank you! Congratulations to Synergy Formwork who were awarded the prize of the Large Company category at the ELLES Reconnaissent 2018 event! Synergy Formwork has been a CTRL customer for 7 years and we are proud to see their success pay tribute to women in the construction industry. Congratulations on your success! Photo: On the left, Mrs. Isabelle C�t�, President and CEO of Synergy Formwork and a member of the Board of Directors On the right, Mrs. Isabelle Perron, Senior Computer Management Specialist CTRL. Celebrate With Us the Success of Women in Construction! 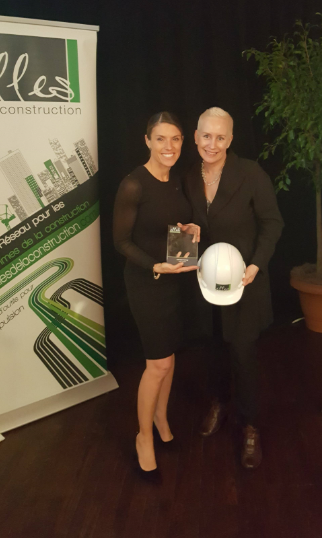 It's tonight that will be held the big Elles Reconnaissent 2018 event that allows up to pay tribute to women in the field of construction. Several guests of honor will also be present, to name only Mary Van Buren, President of the Canadian Construction Association and Diane Lemieux, President and CEO of the Quebec Construction Commission. CTRL will be proudly attending and we will be presenting a door prize. Looking forward to meeting you there! Le Centre Sant� Globale Les 4 Chemins will open in Laval on the 9th of October to accompany the community through the various spheres of life. A team of more than 20 professionals will be there to meet all your needs, whether it's related to health care, therapeutic care in integrative and complementary medicine, academic support, or even professional and personal support. In each of these four spheres, the multidisciplinary center will offer training, workshops, conferences, and forums to help you take good care of your well-being, both physical and psychological. CTRL is proud to be able to participate in the establishment of this center which will help its members to develop their full potential. To book an appointment or to learn more about Le Centre Sant� Globale Les 4 Chemins, visit their website at sante4chemins.com. It is with great pleasure that CTRL announces the appointment of Michel Guit�-Beaudoin as R&D Co-director. The latter will now accompany Mr. Philippe Constant in the role of management and development of CTRL solutions. Mr. Constant, who's working for CTRL since its beginning, is very happy to be joined by Mr. Guit� to accompany him in the future projects and technological challenges of the company. In the technological field, innovation is the cornerstone of growth and there are many technological management challenges. In this perspective, this co-direction will allow CTRL to continue and accelerate its pace of product development. Mr. Constant will mainly be responsible for technological innovation and Mr. Guit� will ensure the optimal and structured management of innovation to bring it to the commercial stage with success. This first co-direction at CTRL is part of an innovative vision of the management. In an era of evolving technologies, business models also need to be revisited to better adapt to new agility-based business contexts. We are, therefore, very proud to have a team at the forefront, both technologically and in terms of management. Congratulations to Mr. Guit� on his appointment. Quality of life is a very important aspect of the CTRL culture and the company is constantly striving to improve the quality of life of our society in participating annually in various fund-raising activities. For a few years now, CTRL has been wholeheartedly supporting the FQAUE (Fondation qu�b�coise Aidons un enfant) which has raised donations to help children in need in Haiti since its founding in 1985. This Friday, August 24th, will take place the annual golf tournament of the FQAUE at the golf club Le St-Ferr�al to raise funds for their project Cabaret. CTRL will proudly be there and invites you to participate. For those unable to be there, but who still want to offer their support, the foundation accepts donations online on their website. Looking forward to seeing you there this Friday! CTRL/Finance Now Supports a Complete Multi-Currency Management! Manage all of your financial inputs and outputs from different currencies with CTRL/Finance transparency: Unlimited number of currency, automatized conversions at your accounting journals, management of provisions, losses and gains on exchange rate, bank reconciliation and multi-currency management. Put your mind at ease with our turnkey solution and develop a more efficient management with your international suppliers and clients. The growth of your company, CTRL holds it dear! Contact us now to know more about our multi-currency project management. Video: The innovations of CTRL Construction ERP Version 9! Watch this video to discover the impressive new features of version 9 of CTRL ERP software specially designed for financial and project management in the construction industry. 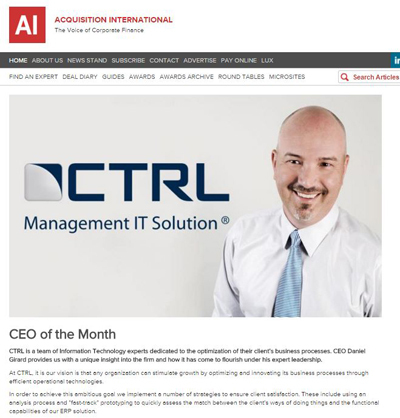 Daniel Girard, CEO of CTRL, was designated "CEO of the Month" in the UK newspaper "AI" (Acquisition International), December 2015. Congratulations to Madame Diane Felx, winner of the CTRL prize at the last social meeting of Les Elles de la construction! 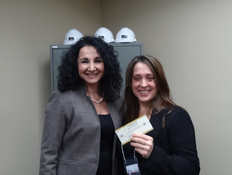 Congratulations to Madame Diane Flex, Construction Project Manager, who won the CTRL prize at Les Elles de la construction's last social networking event held on January 29, 2015!